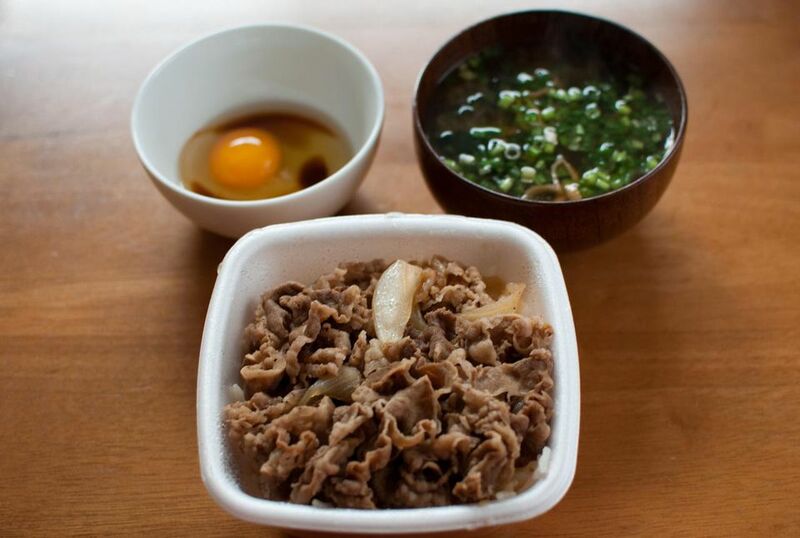 One of the most popular rice bowl dishes in Japan is gyudon -- simmered beef served on top of steamed rice. Gyudon (or beef bowl) is like a comfort food for the Japanese. It can be prepared quickly and it has nutritious ingredients like beef, onion, rice, and sometimes egg. This is a great meal when you have a full schedule until dinner time. If you are tired of ordering in a pizza, think about gyudon tonight. In Japan, gyudon is sometimes served with a raw egg yolk or onsen tamago (poached egg) in the center of the meat and onion mixture. As raw eggs are not recommended in the U.S., you can try making onsen tamago by pouring beaten eggs into the pan right before serving so that they will be cooked. Put dashi, soy sauce, sugar, mirin, and sake in a large pan and bring to a boil over medium heat. Add onion slices and simmer for a few minutes or until softened. Add beef to the pan and simmer for a few minutes. Serve hot steamed rice into individual deep rice bowls. Put simmered beef on top of the rice. Top with some optional benishoga.